Happy Monday lovelies. I have a fun movement to tell you about today! It's from an innovate brand called, MakerWear, who uses crowd sourcing as a way to let hidden talent be discovered, and transforms cool ideas into real tangible products! Take this camo panel hat for example. It was designed by J.J. Spectre who submitted it to MakerWear, and is now available at select Target stores nationwide with 11 other designs! How cool is that?!! I don't consider myself a baseball cap kinda girl, but this design really drew me in. I loved the neutral colors and the leather strap detail on the back. 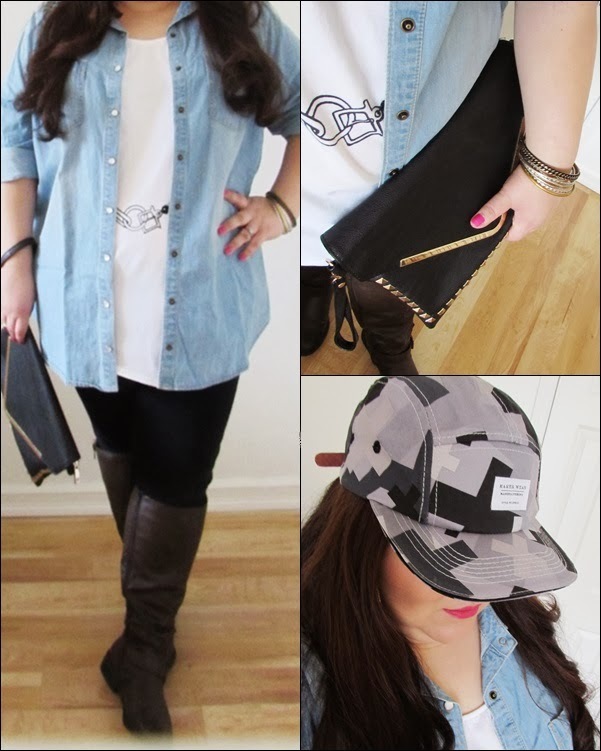 I paired it with my Isabel Toledo t-shirt, chambray shirt, leggings, and boots for an easy casual outfit. For more information about MakerWear, or to join the "Face Of The REvolution"contest (which gives the winner a MakerWear photo shoot, AND get a $1,000 Target Gift Card - Holla!) be sure to visit their website here. You look fabulous, I love the bright lipstick with your gorgeous dark hair! Very nice cap and another way to rock the camo look! Your tee is adorable! and the hat is the perfect touch!